What Do We Mean By Revolution? Whatever else you might think of Russell Brand at least he has re-introduced the word ‘revolution’ into the political vocabulary. But what is a ‘revolution’? A revolution, then, is ‘a change in the basis of society’, whether or not this is accompanied by violence (Morris in fact thought it would be), a change that has to be fairly rapid, involving a clear break with the existing society. 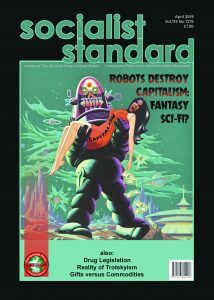 The change in the basis of society which socialists envisage is a change from what exists today, where society is based on the ownership and control of the means of wealth production – the means by which society survives – by a tiny minority of rich individuals, corporations and states. We want to change from that to a situation where the means of production have become the common heritage of all to be used, under democratic control, for the benefit of all. A change from a class society to a classless society. A change from capitalism to socialism. But why is a revolution against capitalism needed? Could it not be gradually reformed out of existence? No, basically because capitalism cannot be reformed so as to work in the interest of the majority. For a start, it is based on their economic exploitation. Because most people are deprived of access to means of production they have to sell their working abilities for a wage or salary to those who do have access. But employers are not philanthropists. They only employ people if there is something in it for them – a profit. If there isn’t, they won’t employ people or else they make people redundant. This happens all the time. Since the only way that wealth can be produced is by humans applying their physical and mental energies to materials that originally came from nature, the source of a non-work income like profit can only be the work of those who work. It’s workers, not their employers, who are the ‘wealth producers’. Profit is the difference between the value of what wage and salary workers produce and the value of what they are paid as wages and salaries. The extraction and accumulation of profit is the aim of production under capitalism. A good alternative name for capitalism is the profit system. Because that’s what it is. It’s a system whose economic aim is the accumulation of more and more capital out of profits. It’s a profit-making system in which profit always has to come before meeting people’s needs. If a profit is not made, economic activity slows down, stops or declines. One of the basic economic laws of capitalism is ‘no profit, no production’. This has various consequences. An obvious one is that production is geared only to what people can pay for, not what they need. The rich get their whims met while the poor have to go without heating. Luxury flats are built while many live in unfit accommodation. In fact, while technologically there could be plenty for all, the profit system means that production stops well below that point. The struggle for profits is a competitive one, with every business trying to maximise its profits. In this ‘battle of competition’ the main weapon is reducing costs by installing new more productive machinery and methods of production. This, too, has consequences. It leads to speed-up and stress at work. And to pollution and the neglect and destruction of the environment. All these problems – housing, stress, pollution, and many others – are interconnected. They are not just isolated problems that can be dealt with one by one. They all have the same root cause in the capitalist system of production for profit and are unavoidable consequences, inevitable effects, of it. This is why capitalism cannot be reformed to work in the interest of the majority by putting ‘people before profit’. Any government that tried to do this would provoke an economic slowdown, even an economic crisis, and would sooner or later have to give up and accept, and even apply, the economic law of ‘profits first’. There have been governments in the past – Labour governments – which could be said to have genuinely and sincerely tried to put people before profits. They have always failed in the end. Not necessarily because they weren’t sincere or were sell-outs or not resolute enough, but because they had set themselves an impossible task – to make capitalism work other than as a profit-making system in which making profits has to be given priority. The Labour Party has learned this lesson and has long since given up being other than an alternative management team of British Capitalism plc to the Tories. But some of those on and to its left have not learned this and still imagine that they can impose other priorities on capitalism than profit-making and turn it into something else. The new Left Unity party, formed in November last year, is a case in point, as are the various Trotskyist groups who campaign and contest elections on such platforms as tax the rich to pay for better schools, homes, transport and the like. If tried, by reducing profits, it would probably provoke an economic crisis. It is surprising how widespread this belief is that governments can change the way capitalism works, when they obviously can’t. This is why we say that socialists should direct their energies to ending capitalism not to mending it, to abolishing it, not managing it. In other words, ‘Revolution not Reform’. That’s our policy and that’s what we advocate. But what sort of revolution do we need? Going back to William Morris it ‘cannot mean a change made mechanistically and in the teeth of opinion by a group of men who have managed to seize on the executive power for the moment.’ Speaking in 1884, Morris probably had in mind the French revolutionary Louis-Auguste Blanqui and his followers who were forever plotting an insurrection to take over the Town Hall in Paris. They never succeeded and Blanqui spent most of his life in jail. His ideas, however, were inherited by Lenin and the Bolsheviks and propagated by their followers in the 20th century. And still are by the Trotskyist groups. It is true that they are not so crude as Blanqui but realise that they need some degree of popular support before staging their uprising. But this support is to be won not for replacing capitalism with socialism but from people discontented for any sort of reason. The end result is the same: a group of people – a minority – find themselves in control of ‘the executive power’ but without majority support for socialism. What they can do in these circumstances is as limited as Labour and other reformists who have got control of executive power on a non-socialist basis, in their case with non-socialist votes. The revolutionary minority, too, have no alternative but to manage capitalism in one way or another. Lenin eventually realised this and had the honesty to admit it and say that the only way forward for Russia was state capitalism, which is what really happened, though both Stalin and Trotsky refused to recognise this. Stalin called it ‘socialism’ while Trotsky regarded it as some sort of ‘workers’ state’ till his dying day, which was when he was murdered by an agent of his supposed ‘workers’ state’. So, by ‘revolution’ we don’t envisage the type of revolution advocated by Leninists of a conscious minority leading a mass of discontented but non-socialist workers and others. What we envisage, rather, is a majority revolution in which the majority want and understand socialism and participate in bringing it about. For us, this revolution must be democratic in both senses of the term. It must have majority support and it must be carried out by democratic means. In a politically and economically advanced capitalist country like Britain and most of Europe, a socialist majority can win control of the ‘executive power’ via elections. That’s our view, as argued in detail in our pamphlet What’s Wrong With Using Parliament? 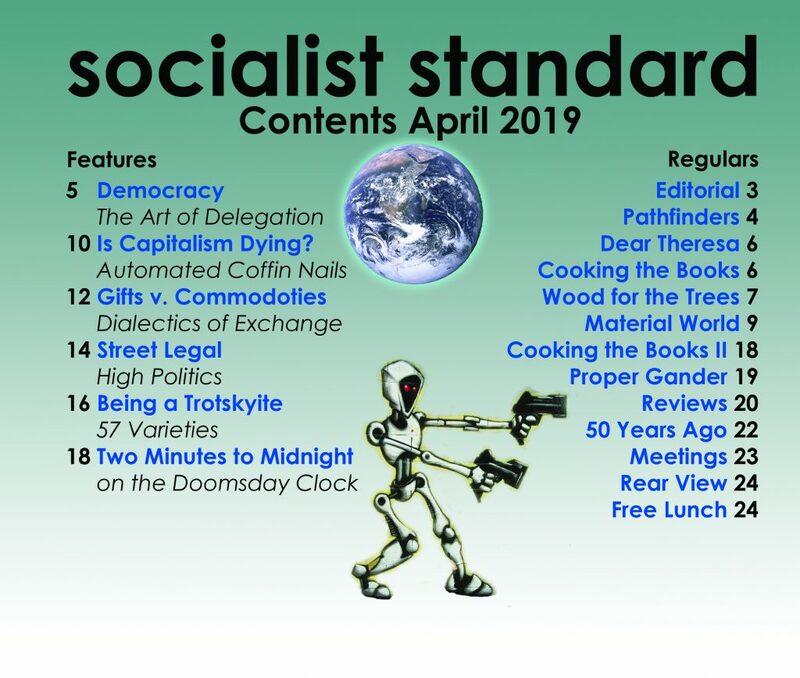 Of course, establishing socialism is not just a question of voting for a socialist candidate and waiting for a majority of socialist MPs to vote it in (much as people do today who vote for a party which promises some reform of capitalism). People have to have organised themselves outside parliament into a mass democratic socialist party, into trade unions and other workplace organisations, into neighbourhood councils and the like. The socialist MPs would be merely the delegates – the messenger boys and girls – of the organised socialist majority outside parliament. So, we have in mind a democratic, majority political revolution which begins with the winning of political power via the ballot box by a socialist-minded majority. The majority then uses this control of political power to dispossess the capitalist class, declaring all property titles, all stocks and shares, all bills and bonds, all limited liability companies and corporations null and void. This means that the means of production become the common heritage of all. The socialist majority can also co-ordinate the physical take-over of the means of production by people outside parliament, organised and ready to do this and keep production going. This done, production can be re-orientated towards meeting people’s needs instead of for sale on a market with a view to profit as at present under capitalism. Goods and services can be made freely available in accordance with the principle ‘from each their ability, to each their needs’. This social revolution will then have been accomplished and socialism will have been established.